Sometimes the answer to the problem is right in front of your face. 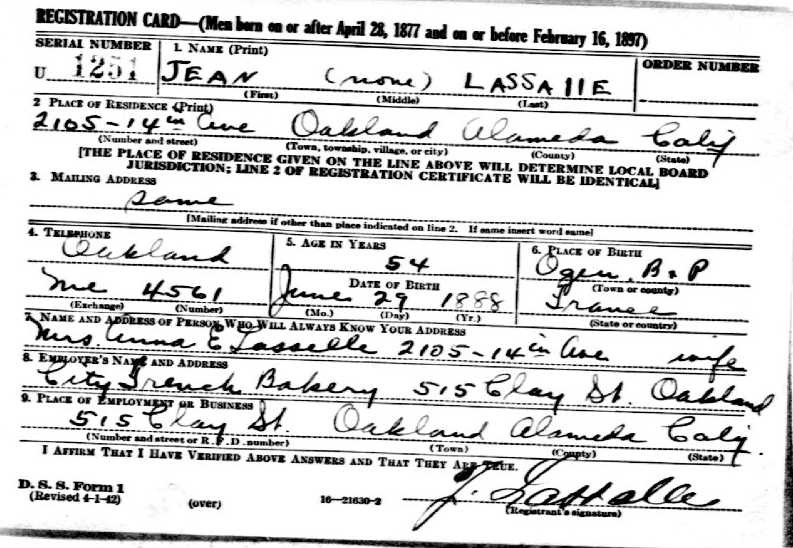 I was pretty sure the Jean Lassalle on this WWI draft registration card was my grandfather. The birthday matches. I was reluctant to say this was my grandfather since the physical characteristics were off. My grandpa was not medium height (unless their was a different gauge for this pre-1920). His eyes were hazel not blue. It also said that he was supporting his father and brother. His mother was alive and well at the time. Her admission made me think twice. Today, I had his WWII draft registration card sitting along side the WWI card. Then, it hit me! His employer’s address on the WWI draft card was exactly the same as his employer’s address on the WWII draft card. In fact, at the time the WWI draft card was written out, he was living there as well! In both cases, he was a baker for a French bakery. This puts some things into perspective. Now that I know that he was employed by the same business from WWI to WWII, I can put some of his other places of employment in order. My Dad told me that grandpa worked for a winery cleaning out the vats before he married my grandmother. I can narrow it down to 1918-1917. This is important. My grandfather came over in 1907. I’ve yet to find him in the 1910 census or early city directories. I can work backwards from the Clay Street address to see when he lived/worked at that address. Then, I can see which Jean Lassalle’s worked at a winery. The problem will be if he was not in the San Francisco Bay Area. There is nothing that says he stayed in the area as a new immigrant to the country. Another reminder of the importance of reviewing old documents from time to time. Sometimes it helps to sit them side by side, too.